After all these years of dreaming about buying a scooter, I finally bit the bullet and placed an order for the X-scooter. 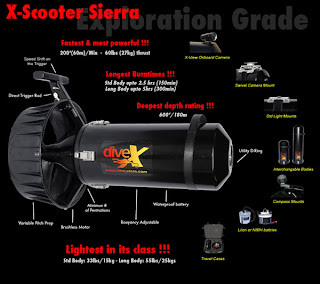 Dive-X is currently offering free shipping with subscription to Wreck Diver Magazine. And with the weak US$, I thought it was about time. I ordered the travel package, which comes with a hard case and compass mount. I don't know how long it will take to arrive but I'm hoping a couple of weeks.